Odissi is an important classical dance form of the East Indian Orissa state. The Odissi originated from Kalinga Desha of India, presently known as Orissa. Earlier Odissi dancers were males. They were called Kothipuwar. The male dancers dressed as females. It is essentially a temple dance. Many of the Odissi dance teachers were known as Kothipuwar. The male dancers (Kothipuwar) still dance. Odissi received royal patronage from kings. According to one of the inscriptions, king Kharavela of the second century B.C encouraged the dance and music forms by carving the figures of dancers and musicians in the caves. The Jagannath Temple of Puri was built during the reign of King Chodaganga Deva who belonged to Ganga dynasty which lasted more than four centuries. He introduced the Maharis (Devadasis) to serve in the Lord Jagannath temple at Puri. Still, his contribution to the art is recognised and celebrated in Orissa. Interpreting the meaning of the songs through dance was generally done through hand gestures and facial expressions. This type of interpretation of songs through dance was introduced in Odissi during the Suriya dynasty. The music of Odissi is a fusion of Carnatic and Hindustani music. Traditionally, Kothipuwars danced on two important occasions. One was Chandra Jatra and the other JhoolanJatra. Initially, the dance form was based on the Vaishnava cult. Later it was cherished and adopted in Saivaism. In the past, they adorned themselves with many ornaments, but today they use a limited number of ornaments. In the past, the Maharis were trained to perform a dance in the temples. Abinayachandrika which is still considered a complete work on Odissi dance was written by Maheshwar Mohapatra, a Minister of King Narayanadeva’s court. Later Odissi dancers were divided into three categories. The first group consisted of temple dancers. Maharis were royal court dancers. Nachunis were the Kothipuwar, the male dancers who performed for the public. With the passage of time, due to the political changes, mainly during the Muslim rule the dance lost the religious values and the art was preserved for entertainment purposes. Generally, most of the Indian classical dance forms enjoyed royal patronage to some extent. Due to royal patronage and encouragement, all the Indian classical dance forms have developed and acquired worldwide recognition today. Sometimes Bharatha Natyam and Odissi are confused by the public. However, there are many differences between the two dance forms. The costumes and ornaments of Odissi resemble those of Bharatha Natyam. Bharatha Natyam and Odissi were nurtured in and around the temples. The male dancers in Odissi were called Kothipuwar. They were dressed as females. The female dancers were generally called ‘Mahari'. In Odissi, the body is in the thribhaga position. The body is displayed in three curved positions. One is the head position; the other is the shoulder to navel position. The last is the navel to feet position. Nirtha and Nirtya are used in Odissi as in Bharatha Natyam. Odissi also uses facial expressions. Odissi and Bharatha Natyam have adapted the Araimandi position. Jewellery used in Odissi is almost similar to Bharatha Natyam. The jewellery in Odissi is made of silver or coated with silver. They do not use stone studded jewellery. The Bharatha Natyam research centres are around Chidambaram and Thanjavur temples. The Odissi research centre is around the sculptures of the Konark temple. Odissi reflects the beauty of Bharatha Natyam and the essence of Manipuri dance together. Odissi originated in the Kalinga Pradesh and the poses depict Kalinga sculptures. In Bharatha Natyam dance poses resemble the temple dance and Thandava poses. 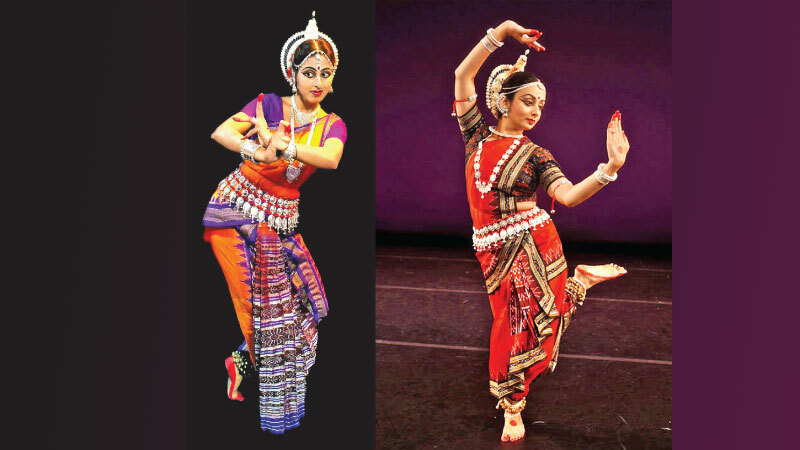 There are certain similarities between Odissi and Bharatha Natyam in items. Geethagovinda songs are widely used in Odissi while in Bharatha Natyam Geetha Govinda songs are used in Astapathy.